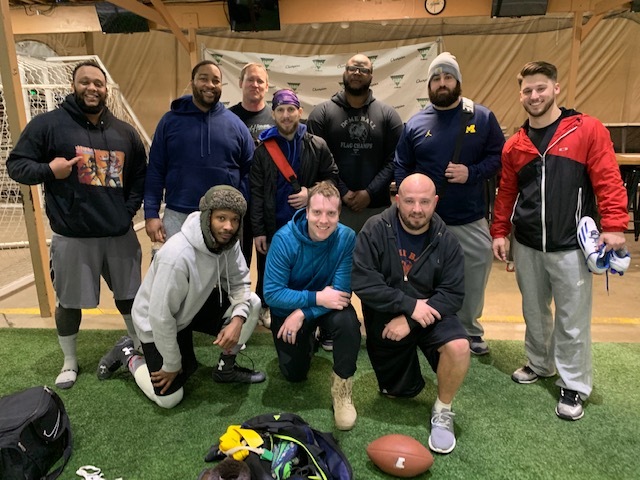 Oakland Yard Athletics celebrates our 23 years of flag football by welcoming teams and individuals to play in Southeastern Michigan's premier indoor flag football league. 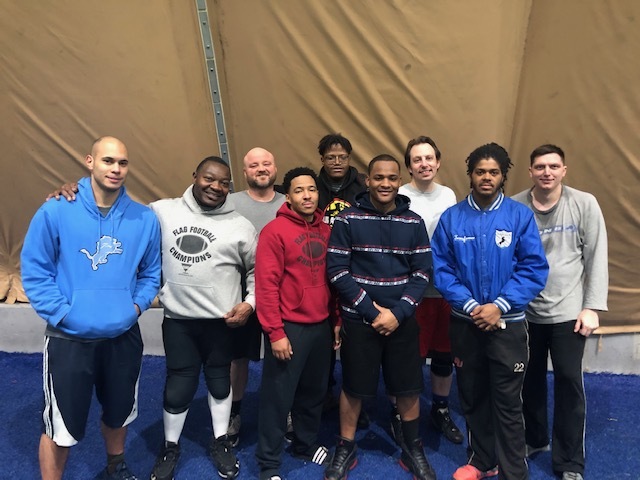 Whether you're a top level team looking for the area's best competition, or you just want to get your football buddies together to play Monday Night Football, our divisional play allows you to play the game against similar level teams. Follow our weekly online Scores, Standings, Offensive/Defensive Team Stats, and the popular Power Rankings, that tell the Good, the Bad, and the Ugly, of how you and your team performed that week. Every team will play a seven game schedule and be included in a seeded Playoff Tournament to determine our Champions. 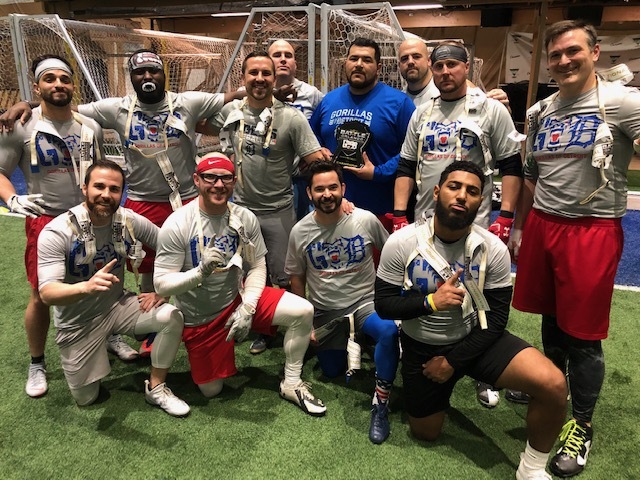 Why settle for playing Fantasy Football and simply talking about your glory days when you can be on the field making plays and scoring touchdowns of your own? Get off the couch and get back on the field! 8 - 7 regular season games and entry into a GOLD, SILVER or BRONZE single elimination tournament based on skill level. Learn from the best, former UM placekicker KC Lopata. Two Seasons To Choose From! Divisions: Kindergarten/1st grade, 2nd/3rd grade, and 4th/5th/6th grade grade. You must register your child online. All boys and girls who are in K - 5th grade. Public, private and home schooled children from surrounding areas are welcome! Three divisions are formed: K/1, 2nd & 3rd, 4th & 5th. Games will be played on Saturday's. All games will be played in the state of the art Oakland Yard Athletics sports dome, 5328 Highland Road, Waterford, MI 48327. All of our programs promote participation, fun, and fundamentals. Coaches are encouraged to fairly allocate playing time equally amongst all players on the team. We will do our best to assure all players receive equal playing time. What types of Awards are given? Each participant will receive an individual participation award. Practice will be held one hour prior to game time. Teams are formed by school and grade. 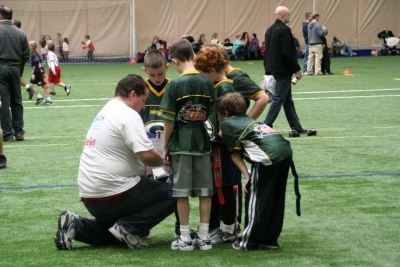 Flag Football teams generally have between 8 - 10 players. Does the league supply uniforms? 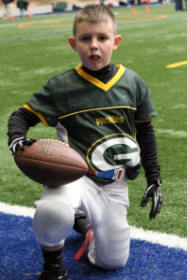 Every flag football player will receive a reversible NFL team jersey, and a flag belt. Who are the officials and are they qualified? We use Michigan High School Athletic Association Officials to officiate our games. Each official is trained, licensed, insured, and certified. A five or six week season, use of indoor turf fields, certified officials, a reversible NFL flag jersey, participation award, background checked coaches, interactive website, organized administration, and a lot of FUN for your family. Do all players need mouth pieces? It is Absolutely Mandatory that all flag football players are wearing a mouth piece before stepping on the field. 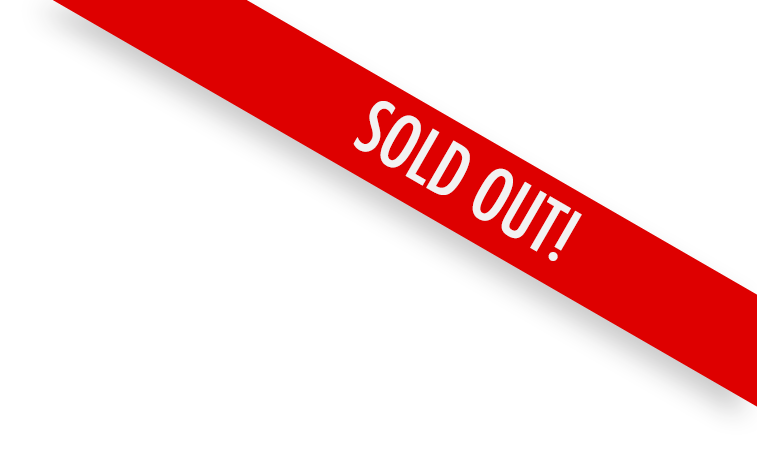 After you register, you have until 5:00pm on the deadline date, to send an email to the league office stating that you would like to withdraw your child from the program. You will be assessed a $30 cancellation fee AND will forfeit your child's uniform and equipment. There will be NO REFUNDS issued after the league deadline date.